On your way to your local vinyl shop to get the latest Bathtub Drain artisan LP (you haven't heard of them yet? 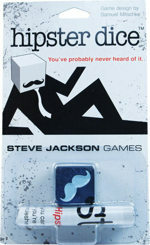 ), be sure to stop by your friendly local game store to pick up Hipster Dice and Munchkin Hipsters. Both are fun to play at your local coffee shop while you and your friends sip on your French pressed brews with a pat of butter on top. They have officially sold out of our main warehouse, so they are about to become vintage. If you get them after that, that's just not cool. 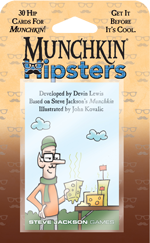 Once your FLGS and Warehouse 23 are out of Munchkin Hipster and Hipster Dice . . . so it goes.